Quick! Off the top of your head,do you know what a trebuchet is? 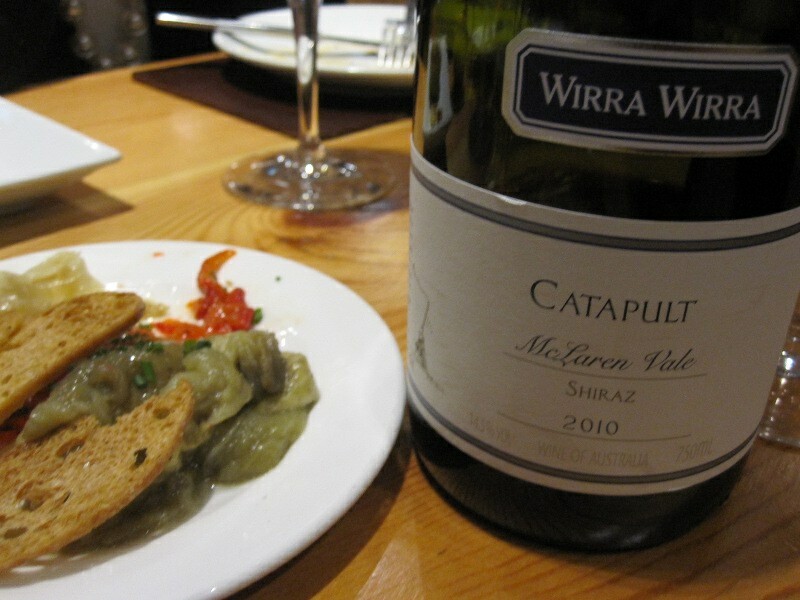 Unless you’re a fan of Australian winery Wirra Wirra or a Medievelist, you probably wouldn’t know it’s another word for “catapult”. That was one nifty bit of trivia I picked up while having lunch with Sam Temme, International Sales Manager for Wirra Wirra. 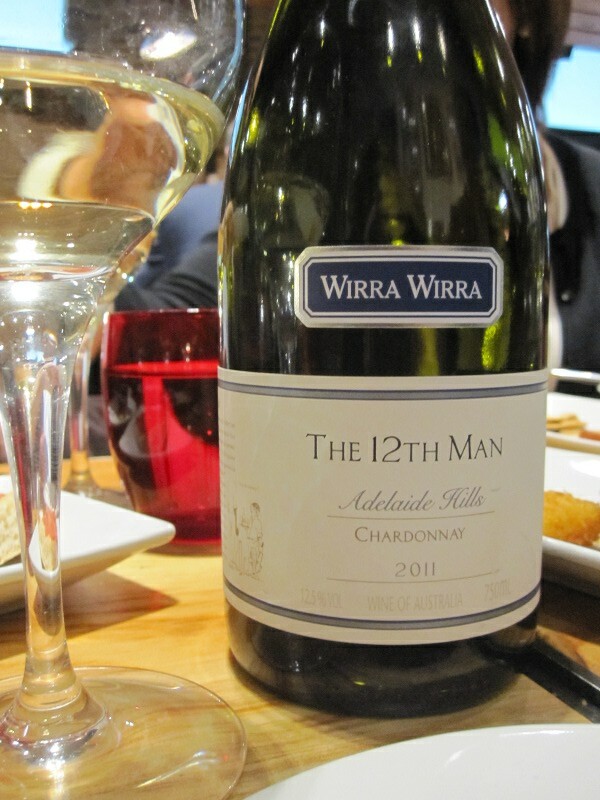 We were at the Spanish restaurant, Camino, and enjoying tapas with the delicious wines of Wirra Wirra. The vineyard was originally planted by Robert Strangeways Wigley but fell into disrepair after his death in 1924 and it was not until 1969 when the property was bought by cousins Greg and Roger Trott that the vineyard was revitalized. Gregg was apparently quite a character and liked to give his wines, er, unique names. Besides the “Catapult” shiraz, there is the “Lost Watch” riesling (named after a lost watch, natch), “Woodhenge” shiraz (use your imagination) and the “12th Man” Chardonnay (something to do with cricket but Sam lost me there) as well as a few other whimsically named wines. The vineyards of Wirra Wirra are in the McClaren Vale and have a great site, only 7 kms from the ocean which means the vines benefit from the ocean and gully breezes that blow over the vines. They own their own vineyards which are certified biodynamic but as they use grapes from growers as well, they cannot guarantee that their wines are biodynamic. We tried a variety of Wirra Wirra’s wine including the above mentioned wines as well as a few others. 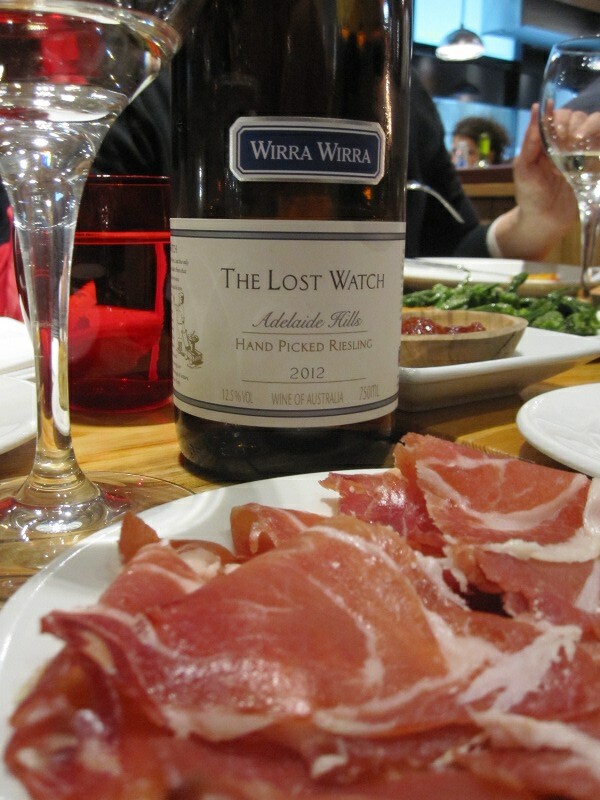 The Lost Watch 2011 is a riesling and in another bit of trivia, when Greg discovered he had lost the watch his father had given him, he swore never to wear another watch again,which might explain why he was rarely on time for anything. The Lost Watch is a light and lively little number, almost water clear, it doesn’t have as much zip as say its Eden Valley counterparts but nonetheless, it is a refreshing, limey riesling. 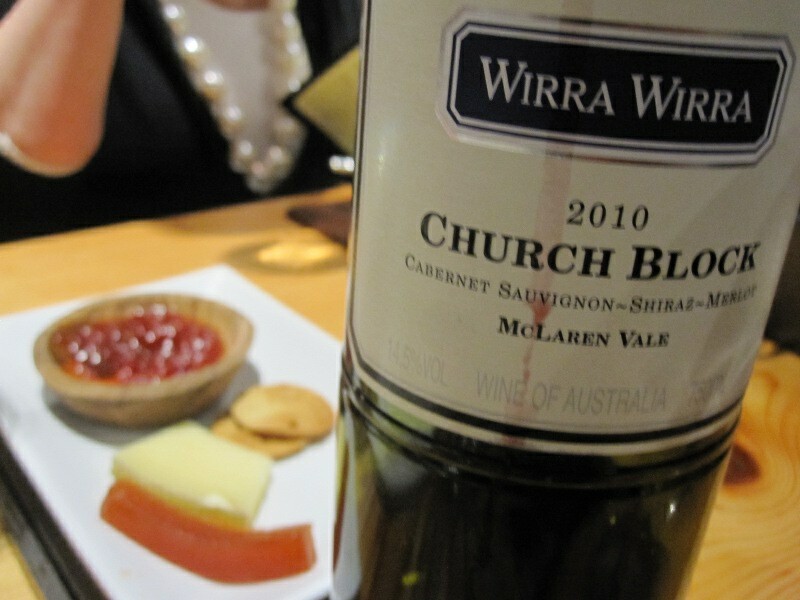 Another crowd pleaser and one of Australia’s biggest sellers is the Church Block, Wirra Wirra’s flagship wine, it’s a cabernet/shiraz/merlot blend and consistently sells out in its native country. After trying the Church Block 2010, I can see why, an aromatic nose, followed by a smooth and savoury mouthful with just enough fruit to balance it out, good structure but not overpowering with a persistent finish. I liked it! The Catapult is a Rhone blend, 97% shiraz and 3% viognier. 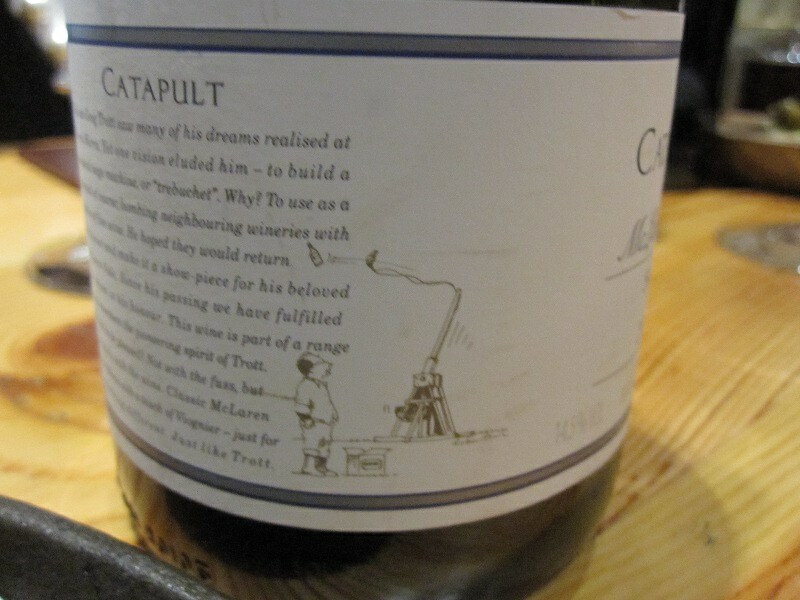 I really liked this wine, the Catapult 2010 was perfumed and juicy,it was balanced with elegance and structure, making it a great wine with lunch. I’m going to finish with a demo of Wirra Wirra’s very own trebuchet, seems Greg had one built and if you ask nicely when you visit, they might even have a go at catapulting a watermelon for you. Good times in the McClaren Vale with Wirra Wirra….